« Can We Be Different Like Everyone Else? Brother (or Sister) Can You Spare a Dime? Tomorrow I will have the opportunity, along with several people a lot smarter than me, to address the NH House Committee on Ways and Means to talk about some of the forces and factors affecting revenue growth at the state level. I’ve forecasted (pretty accurately I think) the impacts of policy changes on state revenues for a number of clients and projects (here is one example I’ve written about in this blog). Things like energy and gasoline prices that affect the disposable income of NH residents and the willingness of out-of-state residents to travel to NH for recreation or shopping (energy prices can affect the price differential calculus for an out-of-stater coming to NH to purchase goods or avoiding travel costs by purchasing higher-priced goods in their home states) are just a couple of examples that can make the difficult task of revenue estimation that much more difficult for NH lawmakers. It’s a tough and thankless job and if I can help I am happy to. 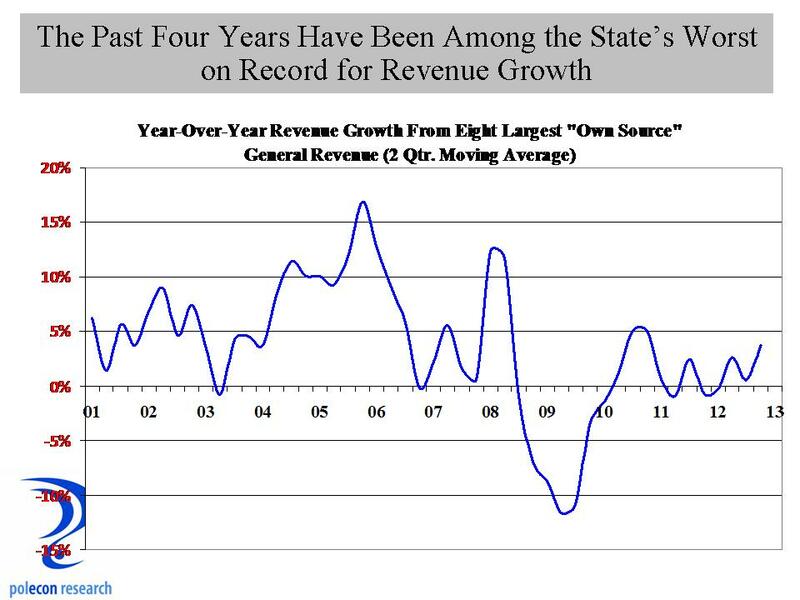 It is especially difficult these days because the news on revenues is rarely good, as the chart below shows, year-over-year quarterly state revenue growth ( from the state’s 8 largest “own source” revenues) has performed more poorly, for a longer period of time, than at any time over the past decade. Some policy actions contributed to that (the decrease in the cigarette tax is an example – although that was only a small contributor to slower revenue growth) but the biggest reason is weak economic and job growth. 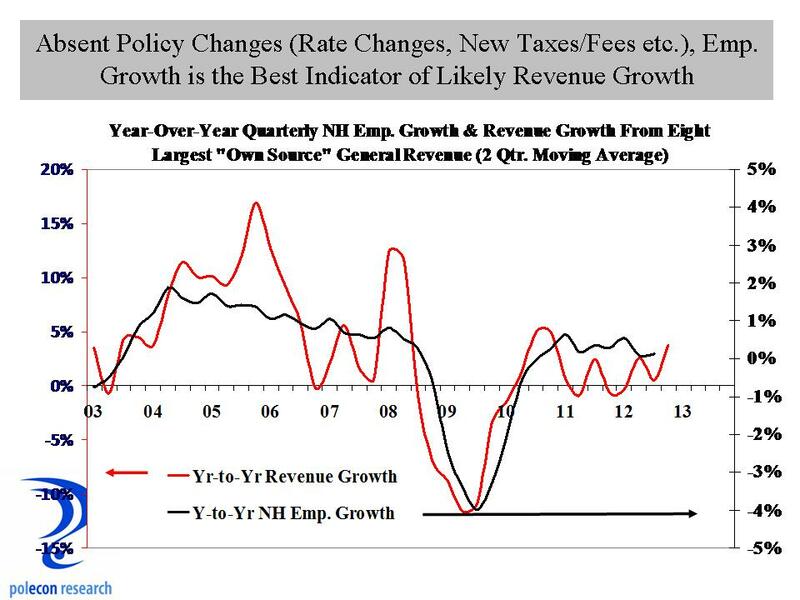 Tomorrow I will present a number of charts and talk about a number of factors that influence various revenue sources but the bottom line is this: until we have more than tepid employment growth, revenues aren’t going to grow significantly and forcing them to grow (via a major policy change) will not contribute to stronger job growth. That isn’t the same thing as saying “any policy change (rate adjustment etc.) will harm job growth and revenue growth in the long run.” NH’s unique fiscal system has survived far longer than many thought possible (and longer than many wanted it to survive) because of balance – those on the left of the political spectrum had to be satisfied with the state doing what it “needed to do” rather than what it “wanted to do” and those on the right had to be willing to allow for some adjustments in tax rates and revenues to keep call for major policy changes at bay. I think that worked pretty well for a long time but it only works when their is a modicum of flexibility and compromise in the policymaking process. That, in fact, may be the best estimator of revenue growth moving forward and you don’t need an expert panel of wonks and nerds to tell you that. This entry was posted on January 7, 2013 at 1:14 pm and is filed under Fiscal Policy, job growth, Tax Revenue. You can subscribe via RSS 2.0 feed to this post's comments.